Fennel is a delicious and versatile vegetable. It has a lovely, light licorice flavor that even the most adamant black jelly bean opponents enjoy. Yet many eaters throw much of this useful plant away. Most recipes that call for fennel are referring to the bulb, the swollen bottom end of the plant. The fennel bulb is enjoyed raw, where its anise flavor is most pronounced, and cooked for a sweeter, mellower version of itself. But don’t pitch the rest! The entire fennel plant is not only edible but delicious. Each part of the fennel plant has a different texture and use: the bulb, the long stalks that make up the length of the plant and the fringe of fronds at the top all have their place in the kitchen. The less appreciated but still fabulous fennel stalks are loaded with the same taste profile as the bulb but are quite fibrous. Older stalks should be used in cooked dishes that allow you to extract their flavor while leaving their texture behind. You will be saving a great source of added flavor and can compost the spent stalks as you would other aromatics such as bay and tea and coffee grounds. Younger stalks can be finely chopped to break down their tough texture and used in place of other vegetables. In vegetable and fish stocks, fennel stalks bring great personality to the pot where they can be used as a compliment or replacement for other ingredients. Roughly chop them and add them to the simmering stock at the beginning of cooking to get all of the fennel flavor or near the end to impart just a hint to your pot. Throw a few fennel stalks in the steamer or boiling liquid for your next crab or shrimp fest to bring a seafood friendly flavor to your crustaceans. Add them to the mix of sausage, corn, potatoes and bivalves at your next clambake (discard before serving). 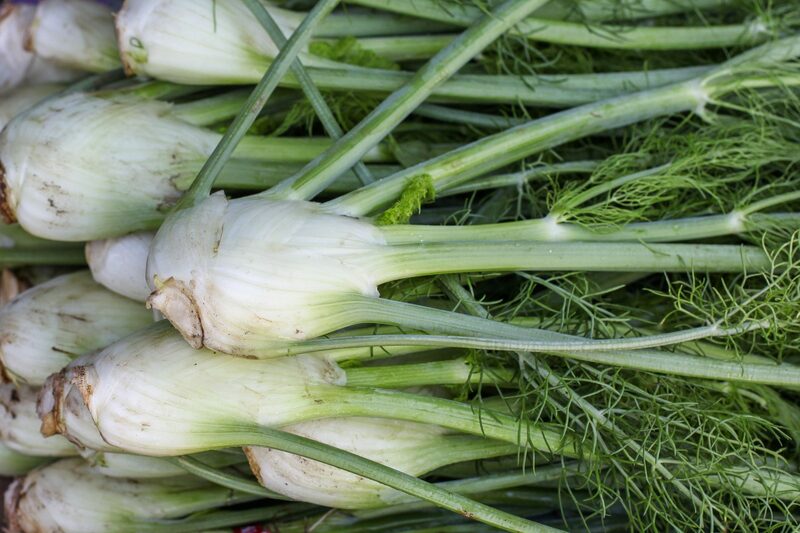 Boil fennel stalks in water for 10-15 minutes to create a perfumed poaching liquid for fish or chicken. Build a “raft” of fennel stalks, pierced through with a skewer to bind them (if using wooden skewers, soak in water for 30 minutes to keep them from burning). Place the stalks under a piece of fish when grilling or roasting to impart subtle flavor during cooking. Young, tender fennel stalks can be sautéed as you would celery. For example, substitute finely diced fennel stalks for the celery that is commonly called for in mirepoix, the classic flavor base of sautéed carrot, onion and celery. Fennel fronds can be used like an herb to impart fennel’s licorice notes in raw and cooked dishes. The fronds keep, wrapped well and refrigerated, for up to a week. So, you can tuck them into dishes for days. Fennel fronds can be added to herb salads where they will hold their own with other tender herbs such as tarragon. You can also mix them into any simple green salad to give it a little herbal lift. Just be sure to mince them finely, as you would dill, to break down their grassy texture. On top of deviled eggs, a bowl of soup, scrambled eggs — any dish that could use a little sprinkle of green and a hint of flavor will benefit from a fennel frond garnish. Pesto is the great food waste disguiser and fennel fronds are no exception. You can add them to the basil-based sauce for another layer of herbaceous goodness. Fennel fronds also make a delectable sauce in their own right. Puree them with oil and add a healthy squeeze of fresh lemon juice. Drizzle on chicken, fish or cooked vegetables. Make a compound butter that is an excellent topper for fish, grilled chicken, pasta hot out of the pot or steamed rice. Simply blend together a stick of room temperature butter with finely minced fennel fronds, a diced shallot or bit of red onion and a sprinkle of salt and pepper. Transfer the blend to a sheet of waxed paper and form into a log. Freeze for up to three months, cutting off coins of the butter as you like. This recipe uses all parts of the fennel plant — the bulb, stems and fronds — to create a delicious infusion. It makes a great cocktail. Try it in a Vodka Tonic, your next Bloody Mary or on the rocks. Or add a splash to tomato sauce. The alcohol in the infusion will open up flavor compounds that are not water soluble, amplifying the tomato taste. The fennel in the infusion will bring a bit of herbal character to the sauce. Sterilize a heat proof jar by boiling it in a large pot of water for ten minutes. Use canning tongs to remove the jar from the water and place it on a clean tea towel. When it is cool enough to handle, pack it with the fennel and pour the vodka over the vegetable. Cover and store in a cool, dry place for 7-10 days, shaking the jar every day or so. Strain through a fine mesh sieve into another sterilized jar. Store in the refrigerator or freezer for up to three months.